, and on arrival dived into Vipassana meditation. The night before a month long Vipassana retreat in Mumbai, I bumped into Krishna Prem who invited me to a talk Osho was giving that evening on the Vigyan Bhairav Tantra. The next morning, I found myself in Dynamic Meditation followed by Shaktipat with Osho. This meeting affected me so profoundly that Osho’s presence took up all of my inner space as I diligently sat through the month long Goenka Vipassana retreat. 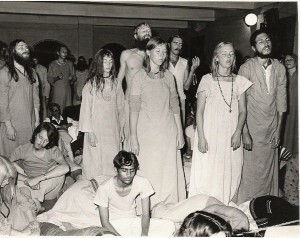 When the retreat ended, I went to Mount Abu to participate in Osho’s Samadhi Sadhana Shibeer, which I heard him translate as meaning, ‘Camp for Inner Ecstasy and Enlightenment.’ The night before the camp began, I met Susheela, a fat and jolly American woman with stunning blue eyes. She asked me if I was going to take Sannyas. I answered her that I didn’t know what that meant. She was shocked and replied, “Haven’t you ever read any of Osho’s books?” “No”, I answered. “I didn’t know he had any books.” She said, “Well, before you go to see him tomorrow, you better read at least one of his books!” She gave me ‘I Am the Gate,’ which I devoured in one reading, finally going to bed at two in the morning. I was up at 5:30am for Dynamic, led by Osho. He had a whole row of drummers whose job it was to create an absolutely wild rhythm for us to breathe, cathart and jump to. 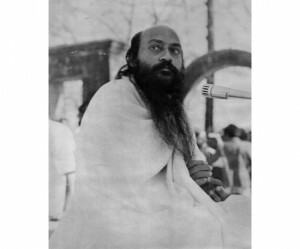 During the lunch break, people could have appointments to see Osho privately. I joined the cue. 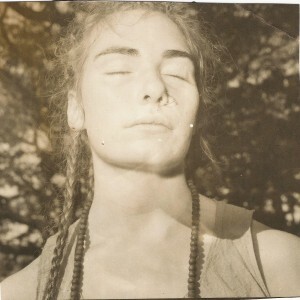 I was wearing my long hair in many tiny braids, which made upkeep while travelling easy. My comportment and manner of dress revealed arduous years spent on the road, sleeping in ditches, eating what came my way, living in the desperate determination to discover the ‘essence of life.’ When I entered the room, Osho asked very sternly: “Where have you been?” “With Goenka,’ I replied. “”Are you ready for Sannyas?” he queried, looking at me with profound amusement. ”Yes,” I answered, dropping down to kneel at his feet. “Look into my eyes,” he intoned softly. I stumbled out into the bright light of the Indian afternoon, newly born, baptised by his eyes, his touch, his beard, his white flowing clothes, his scent, and his mesmerising presence. Occasionally, in my imagination, I move forward to the time of my death, and from that moment look back over my life to find out what are the important jewel like experiences, which have formed the garland of my life. Invariably, the moment of my initiation into Sannyas stands out as being of paramount importance. That life defining new birth turned my path from unconsciousness and misery, to consciousness and bliss. It is to those few precious moments that my gratitude returns, again and again and again. Those moments remain pristine, fresh, timeless, eternal, untouched by time or by death. I am forever at his feet, in deepest surrender, ready for his guidance, open to his love. My name Sheema Khwaja. Where shall I go from here. In this moment. Except hope there is no other expectation in my life. I am stuck badly in this moment. You can write to me about your process and your path and ask a more detailed question. Your question is too vague for me to answer. Yes, I offer Osho Sannyas. I used to be Osho’s medium and some years ago, Ma Neelam from Osho Nisarga has given me the transmission of how to give Osho Sannyas. Therefore, I offer it in the way she has indicated, which is with full ceremony and celebration. Diksha is of course part of this. I do not go to Pune, but you will find me in Osho Nisarga in Dharamsala, in Zorba the Buddha in Delhi and in Osho Sangham in Nagpur area. If you look on my website under the calendar section you will see the list of my activities. Why do you not go to Pune Sarita? I was banned from the Pune resort in 1999. I have not been to Pune since then. This fact has brought joy to many people’s lives because since I am not in Pune I have no choice but to spread the nectar of meditation and Tantra everywhere else! Why were you banned from the ashram? I was banned from the Osho Resort because I disagreed with some of the policies created by the management team there. I expressed my disagreement by staging a demonstration and this did not go down well with the management team. Of course, when I staged the demonstration, I knew I was taking a big risk, but I felt if I didn’t speak my truth, I would not be able to live with myself. And so I took the risk and paid the price for that. Many people have thanked me for taking that step because it meant I left the resort and began travelling and teaching all over the world, sharing the immense gifts I received at Osho’s feet. Thanks for sharing. You are so lucky to have followed your heart.